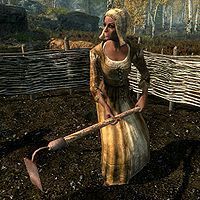 Leonara Arius is an Imperial farmer who works with her recently married husband Addvild at Snow-Shod Farm. She sleeps in the farmhouse every night between midnight and 6am. After a two-hour breakfast she heads outside and tends the crops and keeps going until her bedtime, interrupted only at 7pm for a one-hour dinner in the house. She wears a belted tunic, some boots, and a hat. She wields a leveled dagger (up to elven quality), and carries a selection of common loot and gold. She is very happy with her husband, often saying: "Addvild's made me a happy woman. I wouldn't want to be with anyone else in the world. ", "My husband and I were just recently married. ", or "I like the farm life. It's a huge change from living in a city." She also tells of how she got to where she is today: "I'm originally from Cyrodiil, but I left there after I had a falling out with my family." or "This was the first door in Skyrim I knocked upon, and little did I know my future husband would be answering the door." Leonara: "My darling, you've made me the happiest woman in all Skyrim." Addvild: "It brings me joy to hear that, but what possessed you to say that so suddenly?" Leonara: "I've already lost a family, and we're about to start a new one. I don't want that to happen again." Addvild: "My sweet Leanora, I will never let anything happen to us. I promise." Leonara: "I'm not so sure the few guards they've assigned to the farm are enough." Addvild: "It will have to do. Besides, if it came to blows, I'm sure the Snow-Shod's would come out here and assist us." Leonara: "I suppose so. I just fear they won't make it out here in time." Addvild: "Just worry about keeping the fields tended and let the Jarl worry about the war." This page was last modified on 8 December 2013, at 20:00.